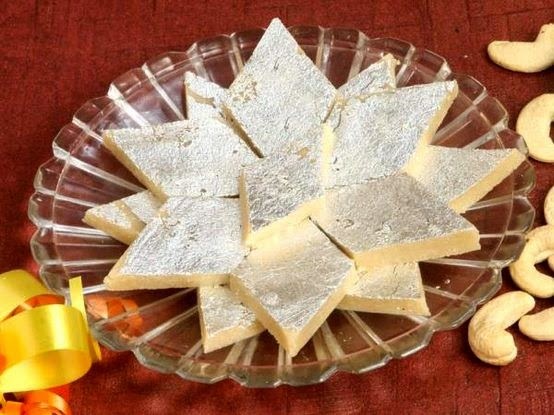 Cashew burfi or kaju katli is most famous Indian sweet dish.Its make with cashew nuts.It is very easy to make.Here a step by step procedure to make this sweet dish. To make this cashew burfi, Put water and sugar into a bowl. Microwave on high rack for 8-9 minutes. The mixture should come to boil and you should get a really thick syrup. Just before it begins to caramelize, pour in milk.Stir. in cashew powder and ghee. Put this back, and microwave on high rack for 12 minutes or until the mixture thickness and fat separates. Lightly grease 1/2″ high on trays and press the burfi mixture on it. cool, cut into diamond or square. Store in and airtight box.